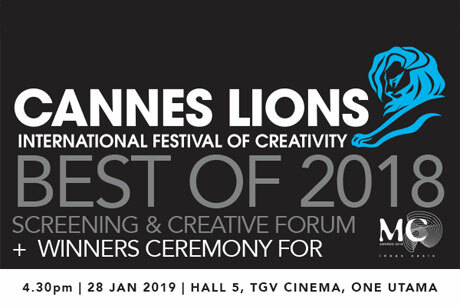 Come January 28, MARKETING magazine will be hosting the screening of the best of Cannes Lions 2018 at TGV Cinemas in One Utama. As the Official Country Representative for the Cannes Lions International Festival of Creativity, a global event for those working in creative communications, advertising, and related fields, the programme will showcase the world’s best in marketing communications. There will also be an awards-presentation ceremony of the recent winners of the MC2 Awards 2018. This will be followed by drinks and light dinner buffet at Chill*X. Hall 5, TGV Cinemas, 3rd Floor, 1 Utama Shopping Centre 1, Lebuh Bandar Utama, Bandar Utama, 47800 Petaling Jaya.